At Zsavooz Sports Lounge & Grill, we feature a family-friendly atmosphere with warm service, great food and cold beer! Our award-winning menu includes hand-breaded tenderloins, fresh, hand-crafted burgers, mouth-watering sandwiches, wraps and salads. We also have eighteen beers on tap, along with great drink specials, pool tables, darts, video games and digital music for your enjoyment. Zsavooz also offers free Wi-Fi and a wide TV selection that includes NFL Sunday ticket and MLB Extra Innings, and hosts fantasy football, pool and dart leagues throughout the year. Our spacious, relaxing patio is now open, and our party room is available for your entertaining needs. 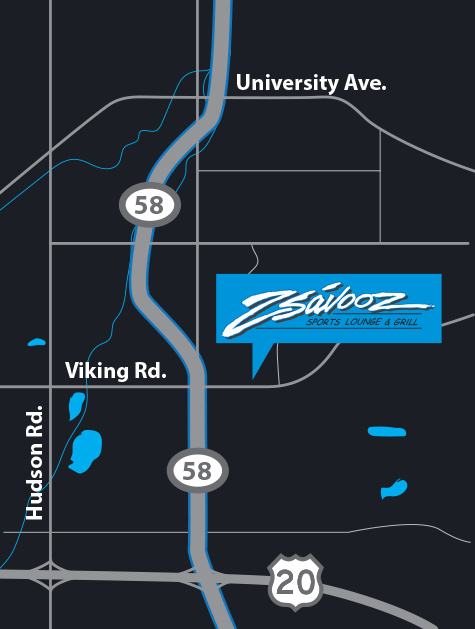 We have been owned and operated locally right here in Cedar Falls since 2003. “I love Zsavooz. The people are great, the service and food are excellent and I have made many wonderful friends with fellow customers.” — Steve R.
“Zsavooz has the best buffalo chicken sandwich in the world, bar none!” — Ardell O. “I love this place! I’ve never had a bad meal at Zsavooz, and I enjoy the extremely friendly staff and great atmosphere. I highly recommend Zsavooz!. You won’t be disappointed!” — Joseph K.
“What a great hangout! Zsavooz is a friendly, neighborhood-style restaurant with great food and service. The staff patiently waited for all 12 in my party to arrive, rearranged the tables to accommodate us and then waited on us hand and foot. I’ll definitely go back there when I’m next in Cedar Falls.” — Evy R.